People will always be complaining on Twitter. The New York Jets will never have a playable quarterback. Modern Burn will be roughly the same 60 cards year after year. ...well, except that last one there. Modern Burn is a deck that has changed very little over the years. There was a time many years ago where it played Wild Nacatl and Atakra's Command, but for the most part it has been the same basic shell, waxing and waning in popularity with how well positioned it was in the format. 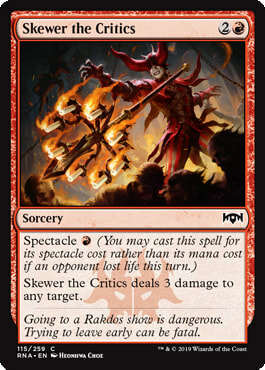 Light Up The Stage and Skewer The Critics are here, and the spectacle mechanic breathes new life into a formerly stagnant archetype. 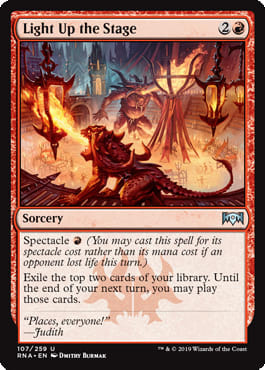 Both cards bring a new element of speed and efficiency to the deck, giving it another Lava Spike effect as well as one of the most efficient draw spells Red has ever seen. Both cards push the deck to lower the curve, making it leaner and faster. Gone are clunky cards like Boros Charm and Skullcrack, and with White gone all together the new splash color ends up being Black for sideboard cards and Bump In The Night. The result is a deck that retains all of the positives of the old Burn deck, but with a new level of speed and resiliency enough to make it a major force in the format. Burn is no longer a deck you play when the metagame is just right, but now a major part of the metagame outright.